THIS ITEM IS NOT AVAILABLE AT PRESENT. WE WILL NOT BE GETTING ANYMORE Nerf N-Strike Elite Universal Suction Dart 12-Pack. From the Nerf N-Strike Elite collection by Hasbro. 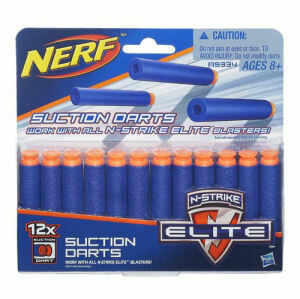 Nerf N-Strike Elite Universal Suction Dart 12-Pack. These darts work with any N-Strike Elite blaster and most original N-Strike blasters. Ages 8 and up.